Looking at today's Tour 2014 stage 7 profile, you couldn't be sure whether the field would survive to the end for a bunch sprint, a breakaway would stay clear, or it would be a sprint among the survivors. And the latter came to pass, as Matteo Trentin barely nipped Peter Sagan in a sprint finish after the pure sprinters were dropped on the late climbs. There was more rain and more crashes, too; Tejay Van Garderen lost over a minute due to an unfortunte crash, exacerbated by his teammate Greg Van Avermaet's late attack. Andrew Talansky also crashed right in the sprint, losing skin but no time. Stage 8 tomorrow will be interesting; the first "real" climbs of the tour, right at the end of an otherwise flat stage, and more rain in the forecast. 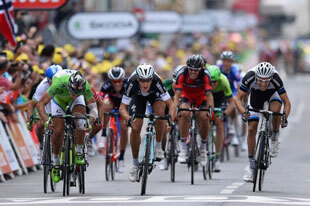 On paper it looks to be a perfect opportunity for a breakaway to survive as a tired and sore peleton take the day off. There will likely be a GC battle for time on the final climb which is short but steep. Stay tuned!